In order to garner support for their demands from the Tamil Nadu government, the state doctors in government hospitals have recently started a joint signature campaign. Palanisamy, organising committee member of the association, has implied in his statement that the prime demand of the signature association was to be given salary at par with Central government doctors. The state government should also implement the recommendations of the Seventh Pay Commission in order. Besides, the Contributory Pension Scheme should be replaced with the old pension scheme. 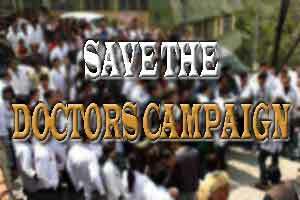 Reportedly team of the Service Doctors and Post Graduates Association has been coordinating on the matter and has till now collected signatures from 165 doctors at the Government Vellore Medical College Hospital, Adukkamparai, primary health centres and taluk-level government hospitals. Madras Medical College and other doctors from Madurai have also been a part of the signature campaign earlier. In addition, service doctors and post graduates from other districts have also joined the brief signature movement. As reported by Hindu, one of their main demands was grant of child care leave with salary for women doctors. “This provision is available for Central government doctors. Child care leave of two years can be split and taken by women doctors from the time of birth of child up to 18 years. The State government should implement this provision for women doctors here,” Dr. Palanisamy pointed out. The association wanted the government to deduct Rs. 300 from the salary of doctors to create a corpus fund for the purpose of helping family members in case of death during service. “Presently, the government is deducting Rs. 30 from the salary of doctors for this corpus fund. Family members receive Rs. 1.5 lakh if a doctor dies during service, and this is not adequate to take care of their needs. We want the government to deduct Rs. 300. This way, families will get Rs. one crore,” he said.